Would you characterize yourself as a good team member? What about an effectual team leader? How do you know? In the workplace teams get formed with such frequency that we may feel fairly well-versed in teamwork and assume that our teams are effective. We rarely set aside time to stop and question these assumptions. Take a few minutes now and think about your last team and consider these questions. Did the team have a shared understanding of its purpose and goals? Were methods of communicating and sharing information agreed upon? Were responsibilities delineated or were members unclear on who was doing what? Did individual motivations help or hinder the team’s work? Did members feel like they have a meaningful role to play? If conditions changed, did the team address how the new conditions would affect their work? Could concerns be raised? Were conflicts handled productively? Were there opportunities to evaluate the team’s progress? How did the team incorporate what was learned along the way? The answers to these questions will provide insight into your team’s effectiveness. If answering them is unsettling, you may want to rethink the way your team operates. One tool that I have found contributes to a team’s success is a team contract. Now, I’ll be honest. The first time I used one I thought it seemed like an unnecessary step. We were all smart, committed, and capable professionals. Why would we need to put in this extra effort to spell out our purpose, document roles and responsibilities, and determine how we would work together? After using team contracts a few times though, I discovered that they are useful particularly because we are all were smart, committed, capable professionals – who have very different ideas and preferences about how to get things done. You can find templates for team contracts online and that may be a good place to start. But, I recommend customizing one to suit your specific needs. I’ve outlined some general components to consider below. Define team and individual goals. You want to go into a team project with a clear understanding of what the team needs to accomplish. Don’t assume everyone knows what the goal is. Take a few minutes to clearly define the purpose of your work together. Having an unclear goal, or even worse, no goal, is the quickest way to nowhere! Additionally, it is helpful to understand what individual team members want out of a project. The degree to which team members will share their true objectives depends on the level of trust that exists. Ideally, team members will feel comfortable revealing what they hope to get out of the experience. The ultimate outcome is for both the team and team members to complete the project having achieved their goals. Identify roles and responsibilities. When you have talented, versatile team members, it is likely that each member could take on multiple roles. Delegating the work and assigning specific roles and responsibilities empowers individuals by giving them pieces of the project. If you are not clear about who is going to do what, you undermine your efficiency as well as risk having teammates step on one another’s toes. You can always trade roles or responsibilities at future points in the project if team members want to gain additional experience or you learn that members’ talents would be better applied in another role. Clarify how you will work together. We all have different work and communication styles. It is important to agree upon processes for working and communicating. It’s also helpful to understand one another’s preferences. I like to include a section in the contract where team members can state what others need to know about working with them. Maybe one team member prefers to think things out through writing while another team member likes to talk through ideas. Knowing preferences in advance may help explain tensions as they arise or enable you to avoid them. Build in opportunities to renegotiate. Establish a framework for taking action should parts of the contract need to be revisited. Set this up when the team forms. Decide at which points during a project you want to evaluate the terms of the contract. Depending on the timeframe of the project you may want to renegotiate at the mid-point or at several points during longer projects. Here are some examples of the types of questions you could ask to unearth team conflict or to re-engage team members in both team and individual objectives. In what ways is this contract serving us well? Are there parts of the contract that we want to renegotiate? Are there roles or responsibilities that we want to redistribute? Again, the degree to which team members are willing to share will depend of the level of trust you have established. These components will get you started on a team contract. For contracts to be useful, however, all team members should contribute to their development and sign off on the final version. Then your team will be better equipped for success. Closing notes: I invite you to contact me for contract samples, to learn more about using team contracts to increase the effectiveness of your teams or other ways in which I might help you develop your organization’s strategic capacity through learning. Are You Prepared to Answer? How Do You Know? What do you want to know? Whether you are assessing quality, trying to answer a specific question or seeking insights, clearly define your purpose. What data will you need? Save yourself time and headaches by making sure that the data you plan to collect will serve your purpose. How will you use the data you collect? How you plan to use the data will help determine which methods you choose and how rigorous your process needs to be. Are you certain your collection methods are sound? In order for your data to be trust-worthy, you have to consider many factors including validity, reliability, neutrality and user-design. Recently, I took two surveys. Both were poorly designed. I took one survey following a visit to a national chain. My experience at the store was positive, but the survey required that I answer all questions even those not applicable to me. That company’s market researchers are gathering data. But, if they are using that information to assess operations, they are doing so based on flawed information. The other survey followed a customer service call with a national provider. My interaction with the customer advocate had been positive, but before I even spoke to someone I was on hold for 30 minutes. The survey I completed after the call did not ask about wait time nor did it include any means for offering additional concerns. Again, this company is collecting data, but they could have a completely false sense of how they are doing. Avoid making these common mistakes. Instead, design flexibility into your research instrument. Questions should be optional unless the answers are absolutely necessary for your data to be credible. Offering a “not applicable” option is a simple solution. 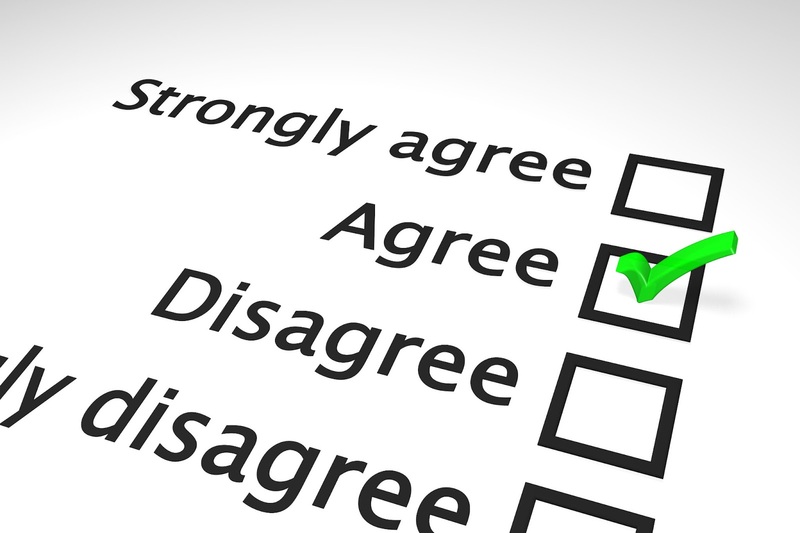 Provide an opportunity for respondents to express additional concerns. Letting them tell you what they want you to know may provide your most useful feedback. Most of all, be prepared to answer the question, “How do you know?” Your decisions and proposals will be more credible. When I was living near Chicago, working full-time during the day and pursuing graduate studies at night, I learned the importance of taking breaks. Diverting my attention away from mental work, even for 10 to 20 minutes, made the difference in whether I was on fire or fried. Only you know when it’s time to give your brain a rest. You can recognize your own signs. Perhaps, you’re struggling to write a single sentence. Maybe you’ve not had a complete thought in the last half hour. For many of us, accomplishing the simplest task becomes difficult when our energy is low. 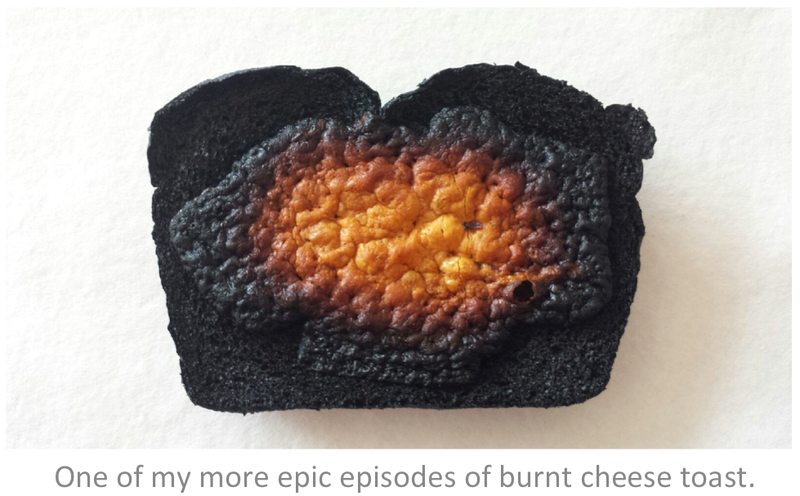 For me, the unmistakable sign that my brain was fried was when I would burn cheese toast. Rather symbolic, isn’t it? Cheese toast was my go-to-food when I needed to eat, but I didn’t want to spend more than five minutes in the kitchen. Most of the time, I could complete this easy task with the efficiency of a short-order cook. However, when I was exhausted and yet still trying to do multiple things at once, the cheese toast suffered the consequences! Thankfully, around the time I was burning a lot of toast (and occasionally brewing coffee without the coffee), I was on a research team studying positive energy. Much of the literature revealed that breaks boost energy and foster creativity. I decided to pay more attention to my energy levels and see what mental breaks could do for me. I experimented with different frequencies, durations and types of breaks. You can try this, too. See what re-energizes you. A really simple break is standing up and stretching. Stopping to eat some nuts or an energy bar can help, too. If you need to clear your head, consider taking a brief walk. That was the type of break that consistently worked for me. When my thoughts felt jumbled, I’d go outside, walk five blocks to Lake Michigan, gaze at the water for two minutes and walk back. (There’s lots of compelling research on the restorative value of natural environments.) By trying a variety of breaks, I was able to develop a sense for what I needed to refuel and regain my ability to focus. Starting is easy. Develop a sense of your own needs by noticing the signs that point to energy depletion. Pay attention to the quality of your work. Are you getting things done or spinning your wheels? Note how you feel physically, mentally and emotionally. These are all clues. Learn to recognize which signs indicate low energy and make mental breaks a part of your self-care. Be on fire, not fried. Closing notes: If you are interested in learning more about energy management, I’d recommend following Tony Schwartz and The Energy Project. I also invite you to contact me for further conversation about how to develop your strategic capability through learning. Is Humility Valued in Your Organization? It Should Be. When your organization hires personnel is humility considered a strength? Naturally, we find confident candidates attractive because they convince us that they are capable of getting the job done. Confidence is reassuring. And frankly, a candidate’s confidence might be enough if every aspect of a job were predictable. Why? Humility opens the door for learning. Humility helps us acknowledge that we might not know everything. Humility enables us to set aside our egos, recognize dissonance in our communities, and see incongruity between our beliefs and actions. Perhaps, most importantly, when sides start to form and stakes increase, humility reminds us to listen – to truly listen. With humility, we recognize ourselves in context rather than set apart. We understand that our views are not the only views that shape our world. Once we understand that, we can ask questions with genuine curiosity, hear others’ perspectives and develop a more realistic outlook. Extolling humility as a desirable characteristic may seem more idealistic than pragmatic, but hubris endangers our ability to remain relevant and advance our causes. Here’s an example. Following a particularly bad meeting in 2010, CEO Dave Balter recognized that his confidence had turned into cockiness. His view had been the only view and it was undermining everything for which he had worked. Balter described this as his wakeup moment and acknowledged, “My attitude prevented us from seeing changes coming until they were choking our business.” He now urges entrepreneurs to bury their egos. That inner strength is important at every level of an organization – CEOs included. Leadership expert Jim Collins identifies humility as one of the characteristics of a “Level 5 Leader” – a leader capable of turning a good organization into a great organization. If you want employees who can help you develop a realistic outlook of your marketplace, understand the needs of your constituents or successfully navigate organizational dynamics, you need to recruit, hire and promote people whose confidence is paired with humility. There are many ways this can be accomplished. Do you construct your interview questions to reveal humility? Do you evaluate employees on how they respond to the perspectives of others? Does your organizational culture punish or praise people who admit to what they do not know? Thinking through questions like these can help you assess to what degree your organization values humility. To dismiss the value of humility in the workplace is to dismiss the value of learning. In a constantly changing world, can your organization afford to do that? Closing note: I want to thank colleagues Jonathan Magid, Glen Esnard, Paul Henley and Gretiana whose thoughtful comments on An Underrated Leadership Practice prompted this post on humility. And, as always, I invite you to contact me for further conversation about how to develop your organization’s strategic capability through learning. Search online for great leadership and you will find hundreds of articles outlining the characteristics, traits and skills great leaders possess. Many of the venerated qualities (e.g., honesty, passion, ability to delegate) repeatedly appear even when interpreted through varying lenses. There is one leadership quality, however, that many of these lists hint at, but neglect to name outright. I’d argue that it is an essential discipline for leaders in the 21st century. Great leaders ask for and show an openness to dissenting and alternative views. This discipline (and it is a discipline requiring practice and behavioral alignment) can make the difference in whether a leader is prepared for shifts in markets, aware of changing perceptions and accountable for his or her own limitations. Dissenting views never hold the whole truth. Nor does any view for that matter. But, if leaders can openly look for what truths dissenting and alternative views may offer, they will begin to see threats and opportunities that may have eluded them previously. Sir Richard Branson, founder of the Virgin Group, intentionally looks to hire his weaknesses. That is an important first step to demonstrating an openness to dissenting and alternative views. Deliberately surround yourself with people who bring skills and expertise that aren’t among your strengths. It’s not enough though. You have to ask your colleagues to weigh in with alternative views. Ask questions like, “What views are not being represented here?” or “Are there obstacles that we have not considered?” Pose questions that allow people to either share their own concerns or those expressed by others. I find it helpful to dedicate time in staff meetings for rumors, concerns and potential problems for this very reason. It helps unearth what may not be easy to say. When what is shared runs contrary to your own beliefs, explore why. Questioning your own mindset and the reasons behind others’ perceptions is essential to understanding what you may have to address in order to achieve your goals. Finally, honor and respect those with the courage to speak up. Even if you disagree, valuing people brave enough to reveal contrasting views will keep you from being blind to the unknown. It’s the unknown that threatens the future of any organization. Fortunately, the unknown may be more knowable than realized. A leader’s best defense against it is an openness to dissenting and alternative views. Closing note: This post was inspired by a number of conversations I’ve had with colleagues lately as well as an post titled “Why We Ignore the Obvious: The Psychology of Willful Blindness” by the amazing Maria Popova on Brain Pickings. I’ve always wanted to learn to play chess. I’m not sure why. I am not an avid game player. Playing games with other people (as a child and into adulthood) always made me nervous. I was afraid of looking like I did not know what I was doing. (We’ll talk about not being afraid to fail another time.) I did like Scrabble because I loved learning new words, but for some reason I had a hard time convincing others of how fun it was! My interest in chess grew after I watched the movie Searching for Bobby Fischer in 1993. I got even more curious in 1995 and 1996 when I read about the matches between IBM’s Deep Blue (a chess-playing computer) and World Chess Champion Garry Kasparov. Still, I never learned to play … until last week. I was spending time with out-of-state family after the death of a beloved great uncle. We had gathered at the home of one of my cousins (1st cousin once removed). I had not been to her family’s home before so my cousin gave me a tour. The tour concluded in a large living area. Her 13-old son told me that the room we were standing in was his favorite. I asked why. He first pointed to the upright piano in one corner of the rectangle-shaped room and then to a chess set displayed on a table in the adjacent corner. I told him that I had always wanted to learn how to play chess and asked him if he would teach me. He immediately agreed and we sat down. He started with how to set up the board. I wasn’t sure how this would go. While I’ve found teens to be terrific resources for learning about emerging technologies, cultural references and music, I worried that I might not pick up on chess quickly and my young cousin would give up on me. It’s not unusual for the knowing among us to become frustrated with those who are learning. We possess a cognitive bias referred to as the “curse of knowledge.” Essentially, the curse of knowledge describes the effect of not recognizing what we know versus what someone with less familiarity knows. You’ve probably experienced the curse of knowledge when you try to teach someone about a familiar subject or activity. It’s easy to overlook fundamental information while describing the subject or activity because once you know it’s hard to remember not knowing. As it turned out, my young cousin was an exceptional teacher and did not yield to the curse of knowledge. I told him I knew nothing. He started with the basics and slowly built layers of information. We actually played a game, but he openly shared the strategies behind his moves and suggested several strategies for my moves, which helped broaden my view of the board. At one point, several other cousins gathered around. I could tell that they saw moves that I did not. For a moment, that old nervousness crept in. But, my teacher generously allowed me to ask questions and consider possible moves in consultation with him. If you have the responsibility of mentoring or training colleagues, take a moment to remember what it was like when you did not know what you now know. It actually requires effort because so much of our knowledge not easy to share or explain. But, recalling what it feels like to know very little will help you be more patient and provide better instruction. Moreover, seeing through the eyes of a beginner opens new dimensions to your own knowledge. Because my cousin avoided the curse of knowledge, he taught me more in one game than I imagine I could have ever learned on my own. More importantly, he made the learning process enjoyable. And, by doing so, he won me over to the game of chess.